Designed for use with gimbal rigs, the Redrock Micro Gimbal Kit for Blackmagic 2K/4K Cameras allows you to add top mounted 15mm LWS rod accessories to your camera adding a minimum of weight and size to your camera. The kit consists of a Redrock Micro ultraPlate, a Gimbal Rail Clamp, and a pair of 6" carbon fiber rods. The ultraPlate for Blackmagic Design Cinema Camera is a low profile top plate for the Blackmagic Cinema and Production 4K cameras. It attaches directly to your camera, and it provides multiple 1/4"-20 threaded mounting holes for adding additional accessories. The Gimbal Rail Clamp attaches to your camera and allows you to attach 15mm rods for mounting accessories. Redrock Micro's ultraPlate for the Blackmagic Camera attaches directly to the top of the Blackmagic Camera to provide multiple 1/4"-20 threads for accessories to be mounted into. In addition to the threads, the Plate features a cold shoe along its center for attaching shoe-mount accessories. The 8-011-0005 15mm Carbon Fiber Rods (6", Pair) are designed specifically for Redrock Micro's wide variety of support systems. The rods are 15mm in size, making them ideal for attaching a mattebox, follow focus, and much more. The carbon fiber nets a total weight reduction of 66% when compared to stainless steel, making the unit incredibly light. Carbon fiber is not only extremely light, but also has a rigidity that exceeds titanium, making it extremely sturdy. The Redrock Micro Gimbal Rod Clamp for Remote Focus attaches to the hot shoe of any camera to provide a pair of 15mm rod clamps, ideal for attaching the motor of a remote focus system. The Rod Clamp replaces the need for a heavy camera baseplate while operating any gimbal based stabilizer. This reduces the weight of the overall system, allowing not only for longer shooting times without operator fatigue, but also the creative freedom to use a wider variety of lenses. 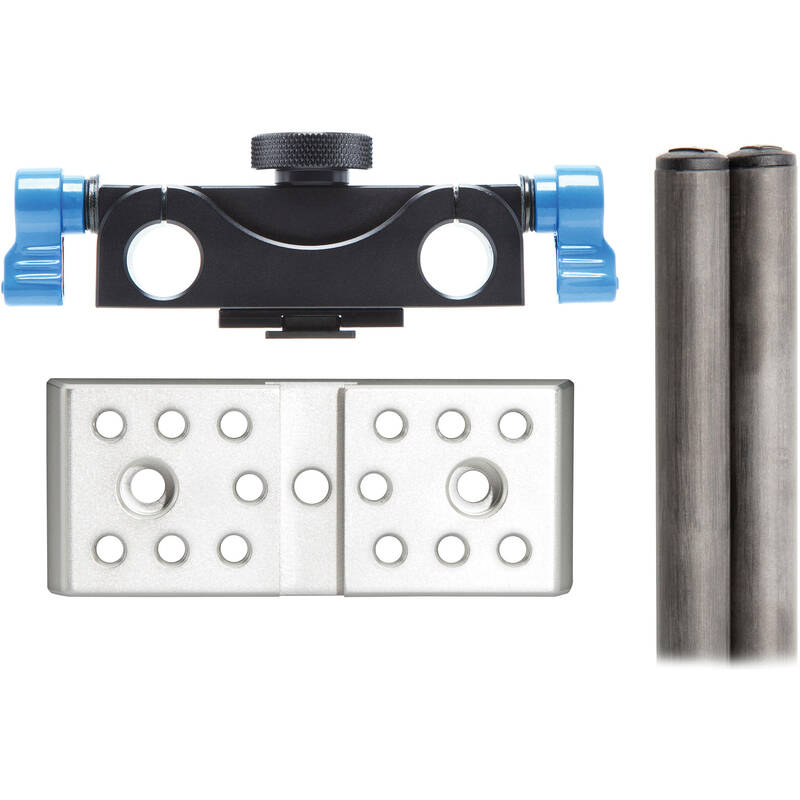 The clamp features a pair of industry standard 15mm rod clamps. This allows for the remote focus motor to be placed on either side of the camera for optimal balance. The ability to choose specific rail length also sheds any unnecessary weight on the rig. The Gimbal Rod Clamp secures to the hot shoe of any camera by tightening its large knurled screw. This allows it to be attached and removed securely without any tools. Box Dimensions (LxWxH) 5.7 x 2.3 x 1.4"
Box Dimensions (LxWxH) 7.717 x 2.756 x 1.575"